Leamington Shopping Park. The vacant site of the former Focus DIY Store is on the right of Debenhams and is where the M&S Foodhall could be built. Plans have been submitted for a new M&S Foodhall at Leamington Shopping Park as part of proposals to redevelop the former Focus DIY Store Garden Centre, which closed in June 2011. The proposals are for a new M&S Foodhall with an in-store café - with a sales area similar in size to the Parade store in Leamington town centre - and two smaller shops for non-food retail on the vacant site between Debenhams and New Look. A public consultation on the draft plans was held earlier this summer, including a newsletter sent to more than 3,000 local homes and businesses. In response, around 218 people attended a two-day public exhibition at Leamington Shopping Park, and 233 comments forms were received from local residents and shoppers (at the Shopping Park). The response forms received demonstrate a high level of local support for the plans, with 95% (of the 233 respondents) supporting the principle of the redevelopment of the site and 84% welcoming an M&S Foodhall as part of the proposals. A spokesperson from Leamington Shopping Park said: “We have had an overwhelmingly positive response to our proposals, and there is clearly a strong local appetite for a new M&S Foodhall as part of the retail mix on offer at the Shopping Park. In particular, we received positive comments when we spoke to those with young children or elderly relatives that would welcome the accessibility of a Foodhall at this location. 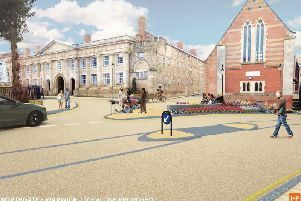 Key issues raised during the consultation have been responded to in a Consultation Report (submitted as part of the planning application), and a number of small design changes have been made to the proposals in response to feedback, including two additional benches, as well as six new cycle stands to improve onsite facilities for cyclists. The plans include an additional 19 public parking spaces, as well as a reconfigured service yard and staff car parking area (including 20 new spaces) to the rear of the new shops, increasing the overall number parking spaces available at the Shopping Park by 39. A Transport Assessment has been undertaken as part of the planning submission, which shows that there will only be a small increase in vehicle trips to the Shopping Park, which the existing road network will be able to accommodate. The Report explains that the majority of customers visiting the new shops will be existing customers on existing trips (either to the Shopping Park or neighbouring shops). M&S has been seeking a site for an additional food offer in Leamington Spa for more than 10 years to complement its town centre stores. You can find out more about the proposals by visiting www.leamingtonshoppingpark.co.uk/developmentplans.